Vigo. Every time I read that I hear, ‘the Carpathian’ – for some reason not unconnected with Ghostbusters 2. The train chatters through countryside dotted with elevated grain-stores. Verges starry with morning glory. 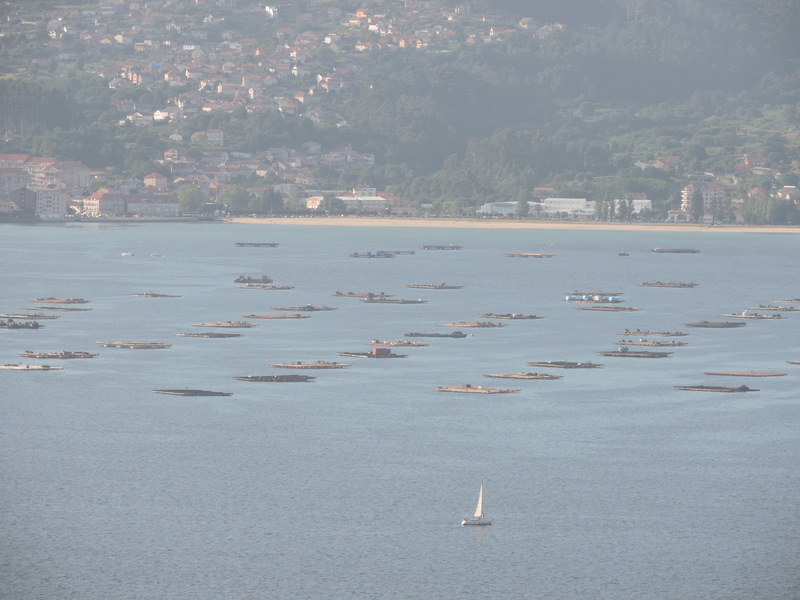 It skirts the broad river to deposit us slap bang in the hustling, bustling commercial port of Vigo. We can walk to our hotel, the notes say. Twenty minutes later, after rolling our cases backwards and forwards trying to find the right roads, dragging them up steep hills (what’s new) a local takes pity on us and points us in the right direction. At the top of the next (huff, puff) cobbled hill is our road. And a multi-storey car park. What with that and the graffiti, the early morning optimism is fast wearing off. 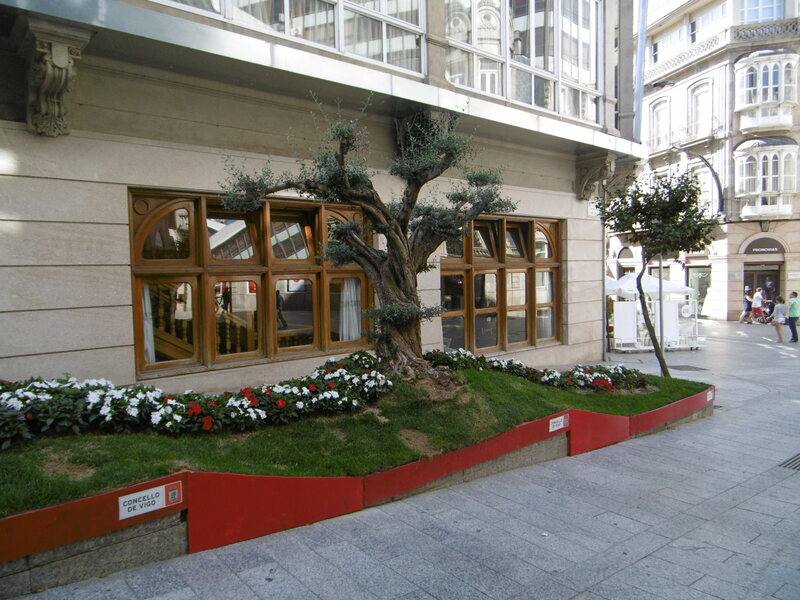 The hotel’s modern, starkly decorated. 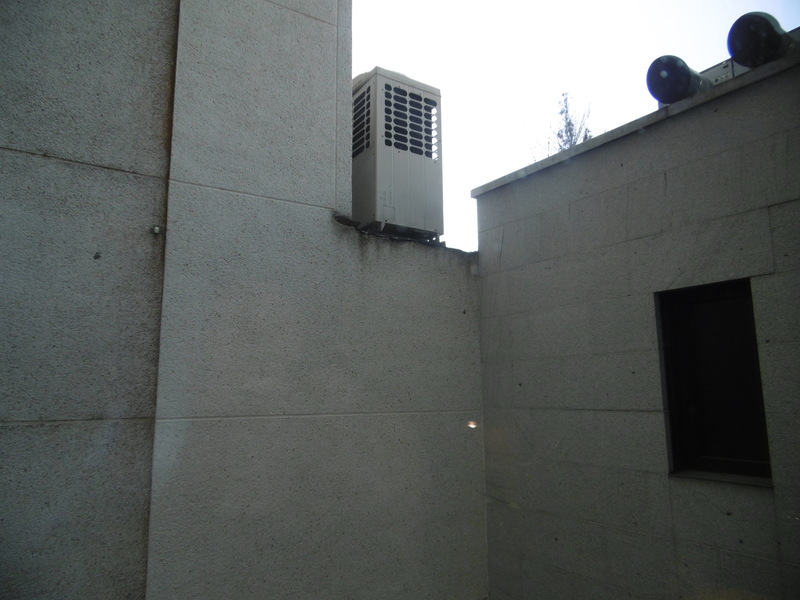 Our view of concrete and air-conditioning units. It’s OK, but has no soul. When we opted to stay three nights our travel company was surprised. Like the guide book, they seemed to think Vigo was just a useful overnight stop en route somewhere else. 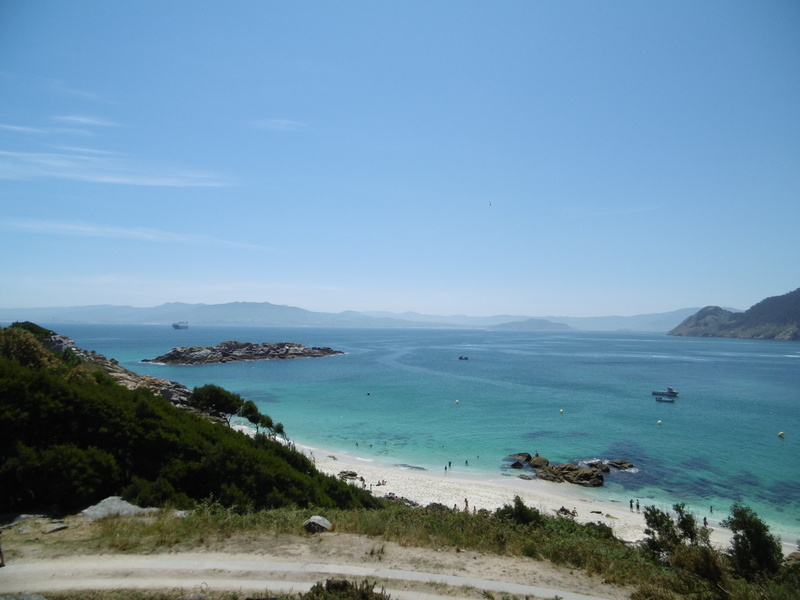 Off the coast of Vigo are the Islas Cíes – the Romans’ islands of the gods. 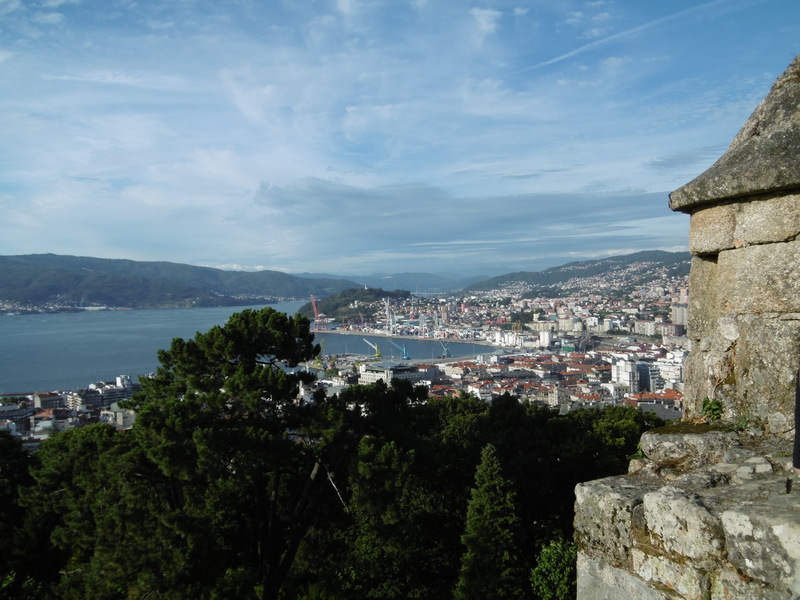 And down the coast is Baiona. We think – we hope – we know what we’re doing. 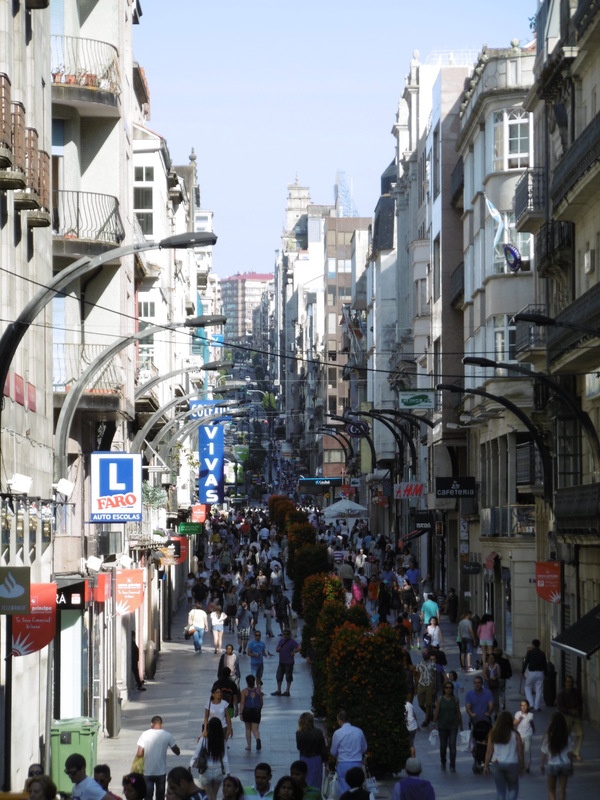 Vigo turns out to be our kind of town. The architecture is fascinating, the shopping streets lively, the sailing end of the harbour beautiful – and the hospitality generous beyond sense. Today is our Vigo day. So we do the maddest thing. Another hill that seems to exist only to torture me with the spiralling path to its summit. The views are stunning. But there’s a dark side to the beauty. Atop the hill was a prison. 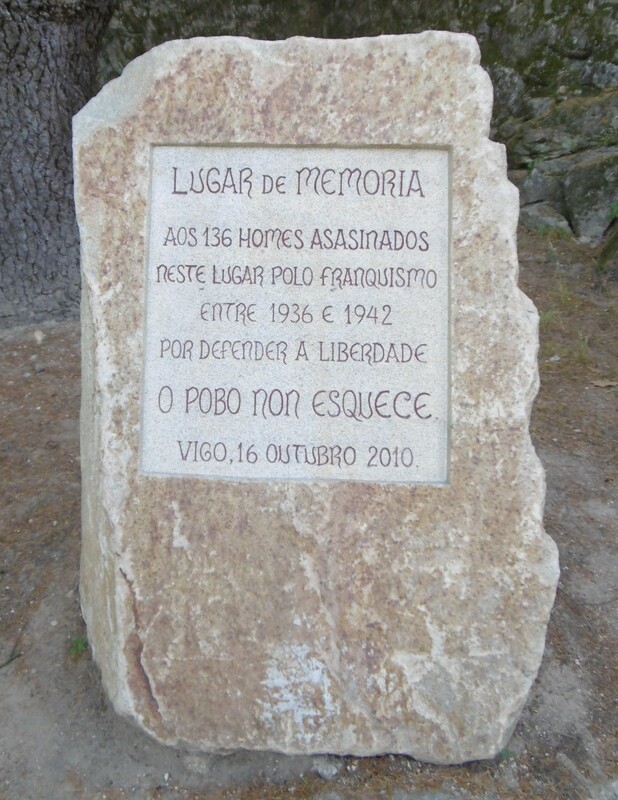 Here local people were executed during the civil war that secured Franco’s long fascist regime. It’s a place that makes me think, not just see. Despite the selfish couple slobbering in each other’s faces at the best scenic outlook, while families revisit the pain of their past. Descending, evening brings cooler air. 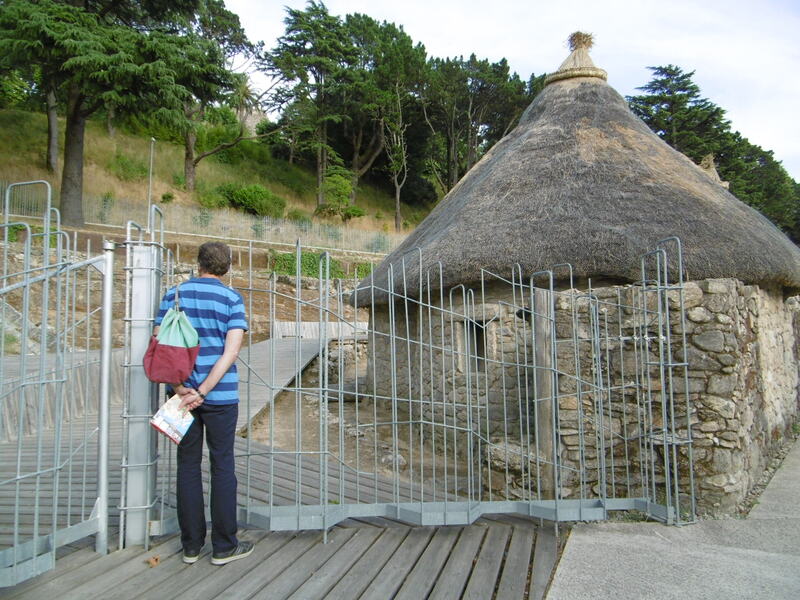 It was a no archaeology trip and then when some appeared – it was closed! Settlement from 1st-3rd C AD reconstructed and locked for the night! By the time we reach town we’re ready for our first wine. 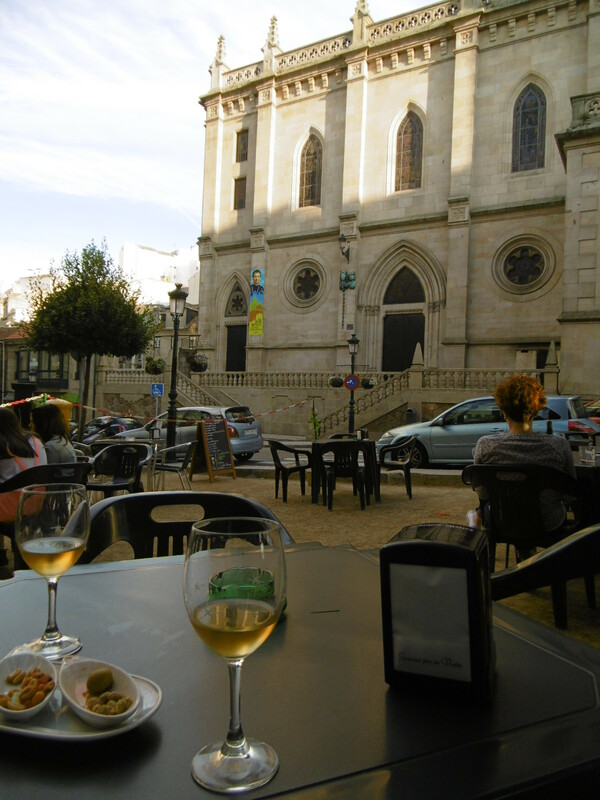 Sitting outside in a hipster area – they’re everywhere – sipping at a glass of cheap white, we overlook Don Bosco church. When we set off again my legs are shaking with the strain. The trek to a vegetarian restaurant feels a step too far, but I make it and am rewarded with a massive plate of roasted seasonal vegetables. 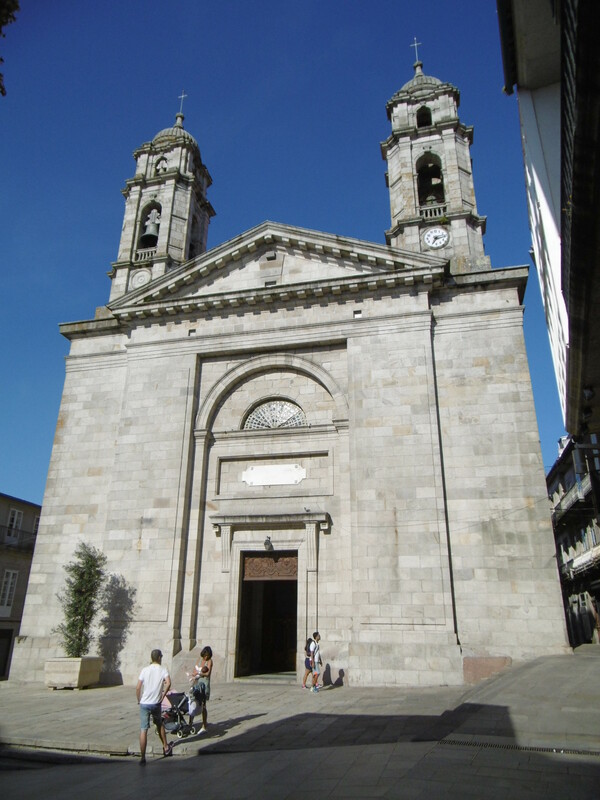 Next day is the British American’s choice – Baiona. The bus zips along the coast on a perfect summer’s Sunday. 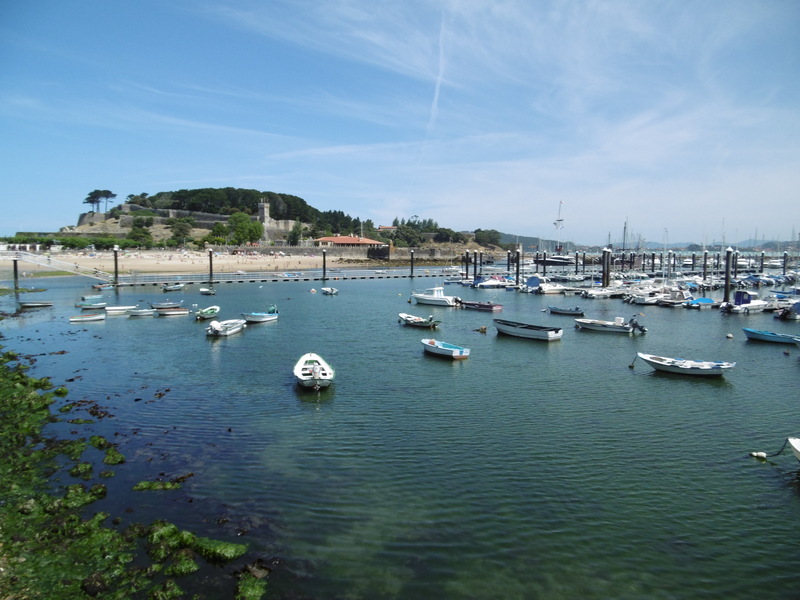 We disembark to a promenade lined with trees, sailing boats bobbing on their moorings. 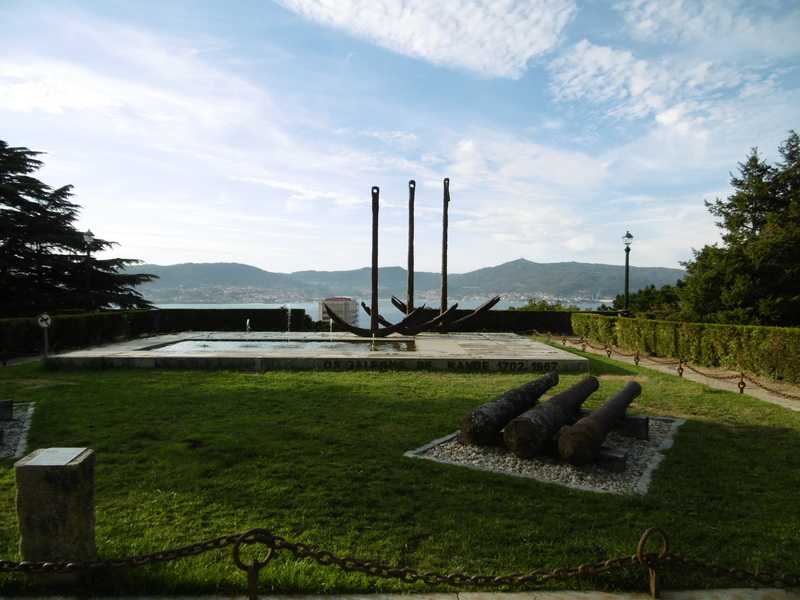 In 1585 Baiona’s inhabitants repelled an attempt by Francis Drake to take the town by force. But that’s not why we’re here. 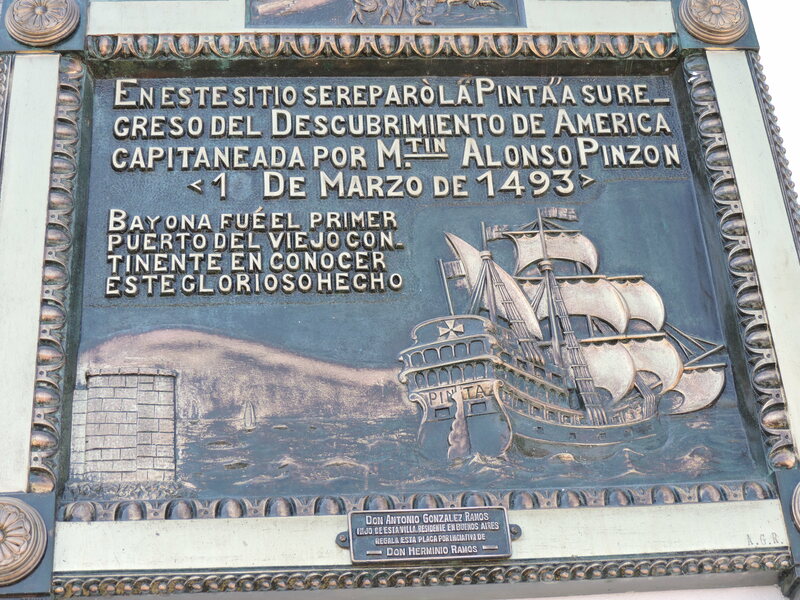 The ‘Pinta’ – a replica of the ship that sailed with Columbus – is our goal. And arguably the resort’s main attraction. 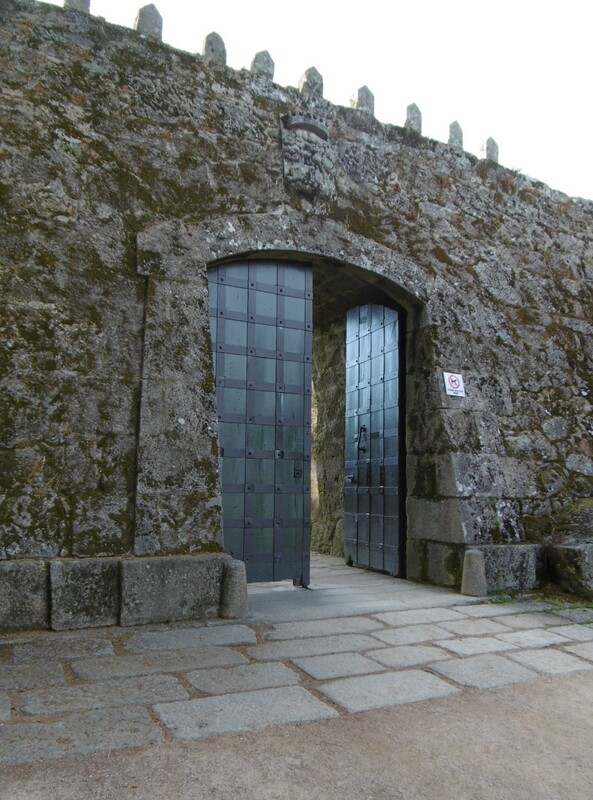 That and the fort that’s now a Parador. We confine ourselves to the ‘Pinta’ and the food. The ship is so small. In a space that feels crowded with a handful of other tourists, 26 men endured the Transatlantic voyage – twice. 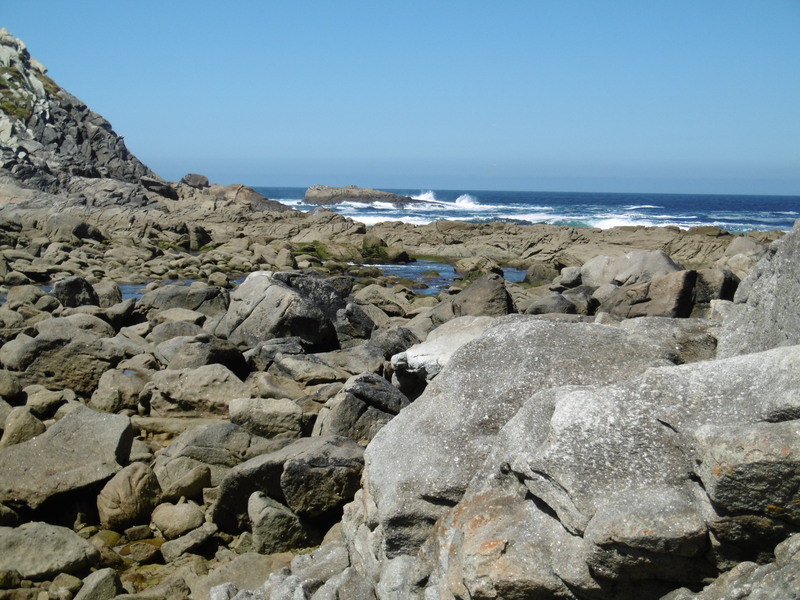 Two ships returned from Columbus’ America-claiming expedition. 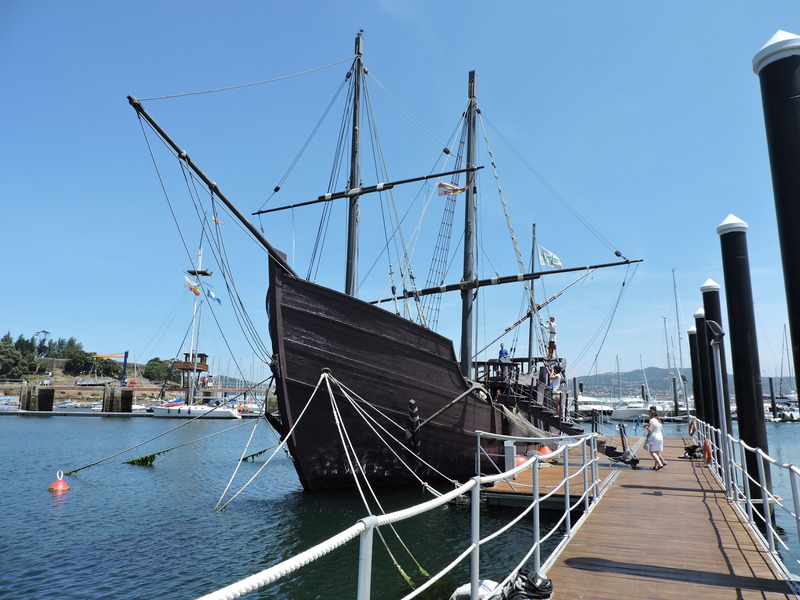 The first to arrive was the Pinta, here in Baiona. Columbus arrived later in Lisbon. So, here the world first heard that a big land lay across a mighty ocean. Here the first seeds of Google and Amazon, Microsoft and Starbucks were sown. Sort of. 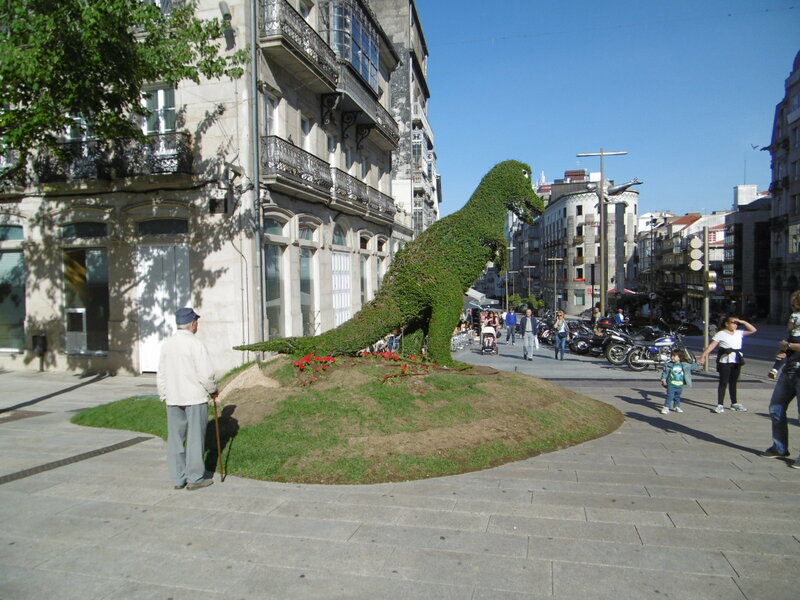 Late afternoon and back in Vigo, with a wonderful day (and lunch) behind us, we tootle around the hills some more, take pictures of street art and sort-of-bonsai street-gardening. Rub shoulders with parading evening shoppers. Drink red wine with Francis-Drake-style seagulls on the terrace of a shopping mall. We eat a tortilla sandwich in an unpretentious café across from our hotel – and its closed restaurant. Sleep till day-three dawns to take us to the sea. Atlantic both sides, but one sheltered and calm, the other wind blasted and wave lashed. Francis Drake hid out around here, too, needling the locals. He got everywhere. The day is fiercely summer. Do we run for that clear turquoise water, to swim? The map gives routes with distances and I’ve chosen the medium-length green one. A local has other ideas, ‘You will only see boring, low views, you will not see the height’. That was the general idea. Sigh. I reach all but the final bird hide before vertigo wins. I stand watching gulls circling, realising, eventually, that I’m standing between two nests with chicks. 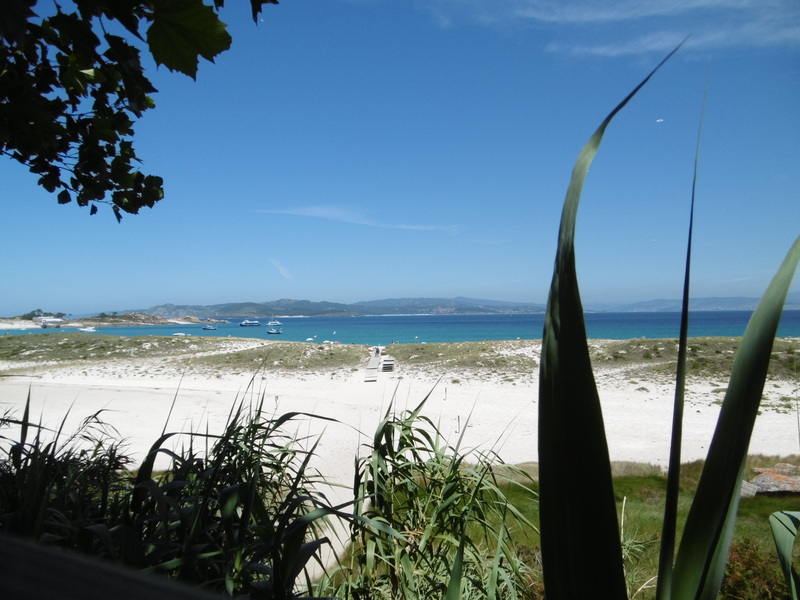 Many ‘ooh’ and ‘aah’ stops later, we find a restaurant tucked behind a beach. The waiters sprinting to keep up with demand. 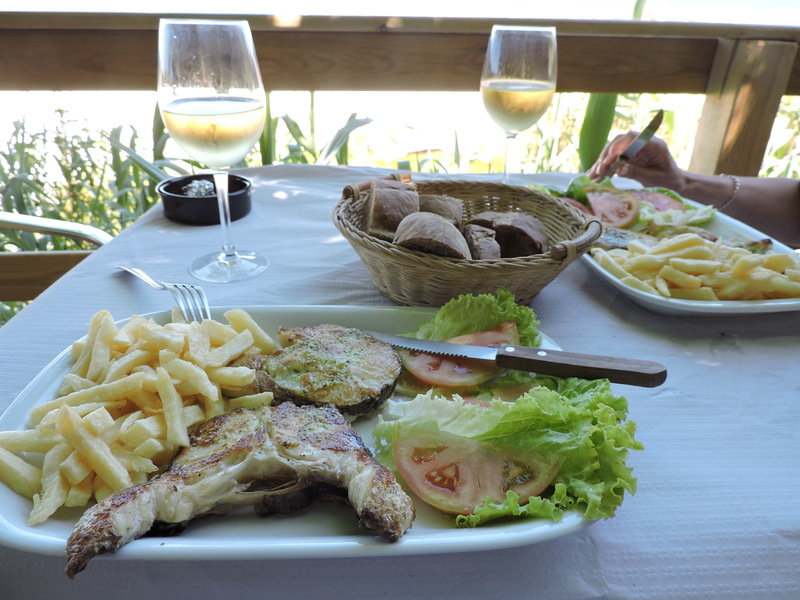 There’s no octopus left so we order hake – merluza a la plancha. And a copa of Albariño each. Believe me, it tasted out of this world – the picture just doesn’t do it justice! 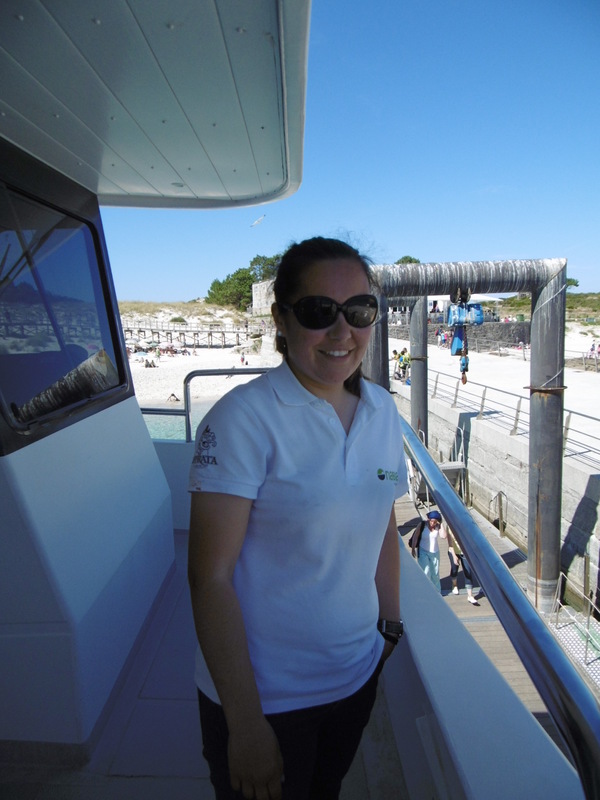 The island’s a nature reserve, tourist numbers are restricted, we have to keep our booking on the boat back. No time, now, for a swim. 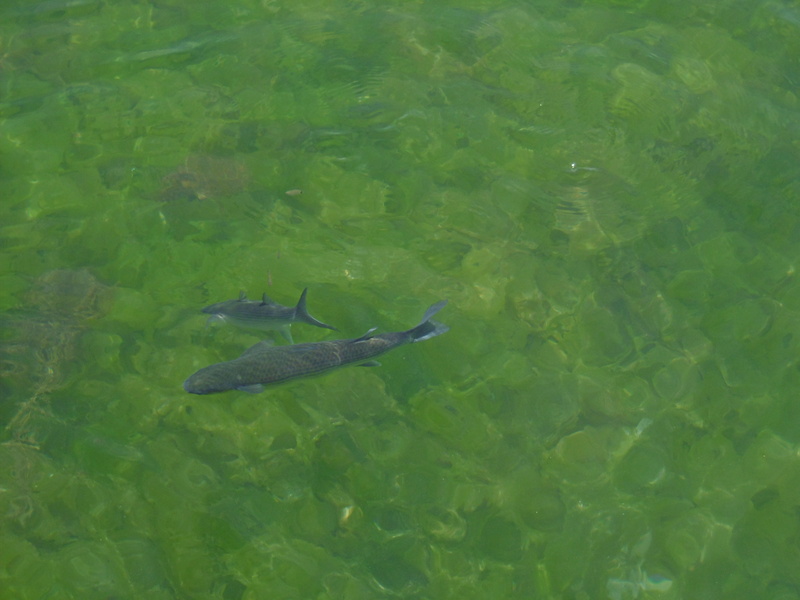 But the male of the species pops his toes in the water and pronounces it very cold. The gentle sail back is a fitting end to the day. 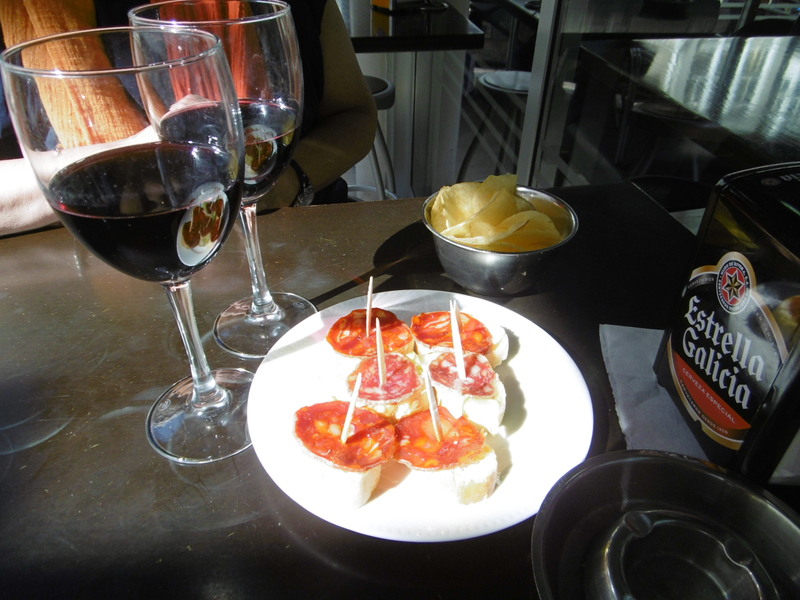 Our lovely female captain slides us in gently to Vigo and we slide off gently to a glass of wine and generous ‘nibbles’ that take the place of dinner. 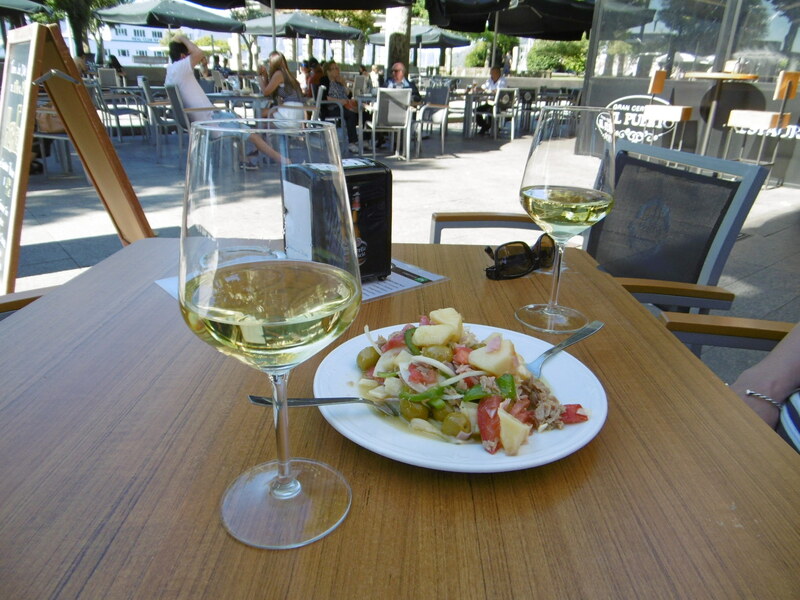 Vigo is a paradise for a foodie. A cheapskate foodie. I had the world’s best calamari in a little restaurant called ‘El Timon’ down near the front – after bouncing off the frantic, oyster-stone-slab part of town. The wine we paid for, this tiny snack came with it for free! And everyone serves wonderful snacks with every drink. Even our hotel, when we finally make it back. A campsite – we’re seriously considering it … beats midges in Beddgelert! 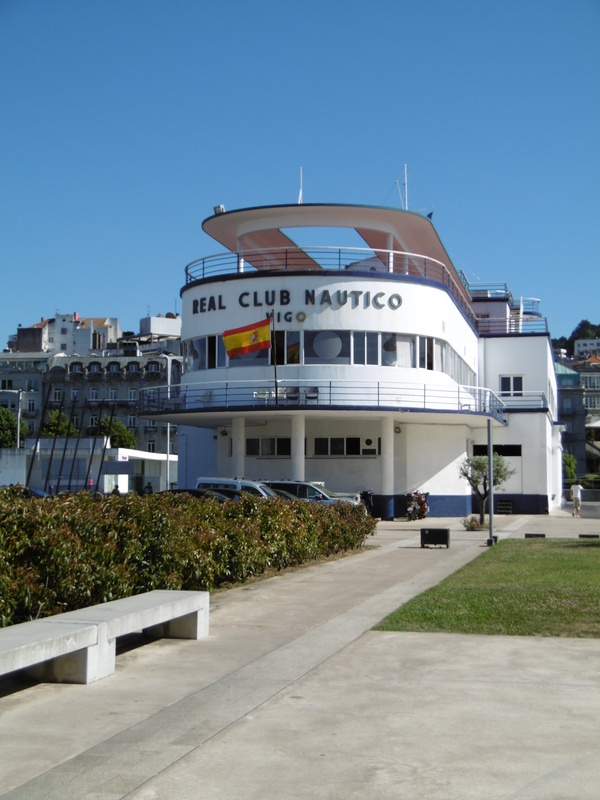 This entry was posted in Travelling and tagged Baiona, calamari, El Timon Vigo, Francis Drake, hake, Islas Cíes, La Pinta, merluza a la plancha, seagulls, Vigo. Bookmark the permalink. Now this looks like heaven! 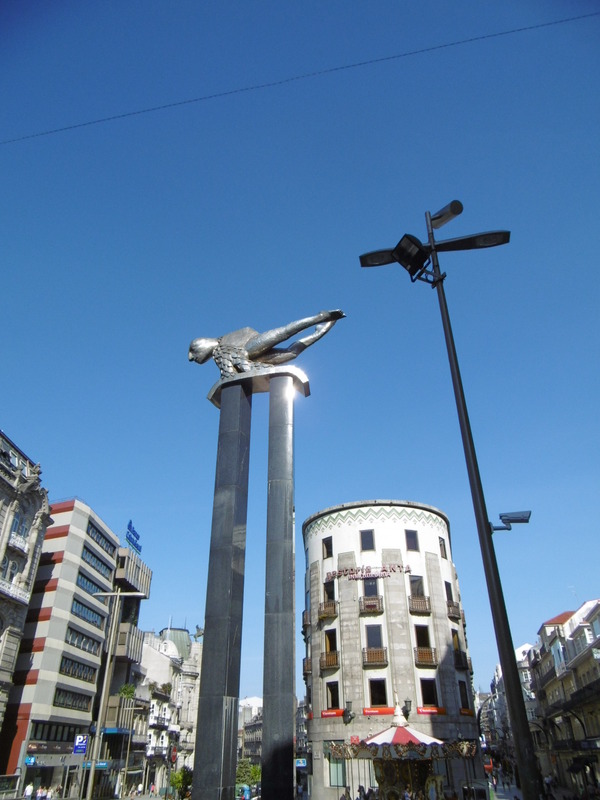 What’s not to like about Vigo? Other than a generic hotel (and there’s no shortage of those everywhere) it looks lovely. Tidy. Lots of amenities and places to eat/drink or drink/eat! 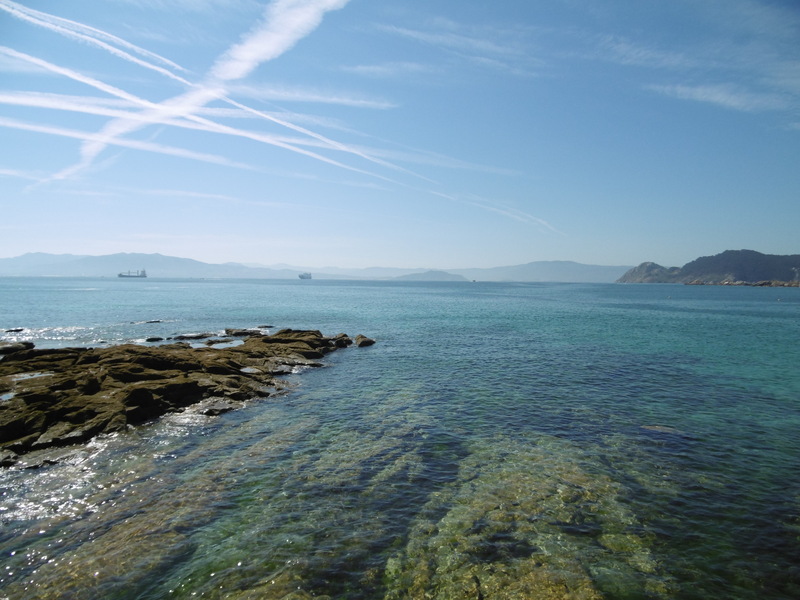 Coastal location proximity to crystal clear picturesque ocean. And interesting historical places to explore. Maybe the locals like to keep it low key and attract visitors who are looking for something more than touristy hype. 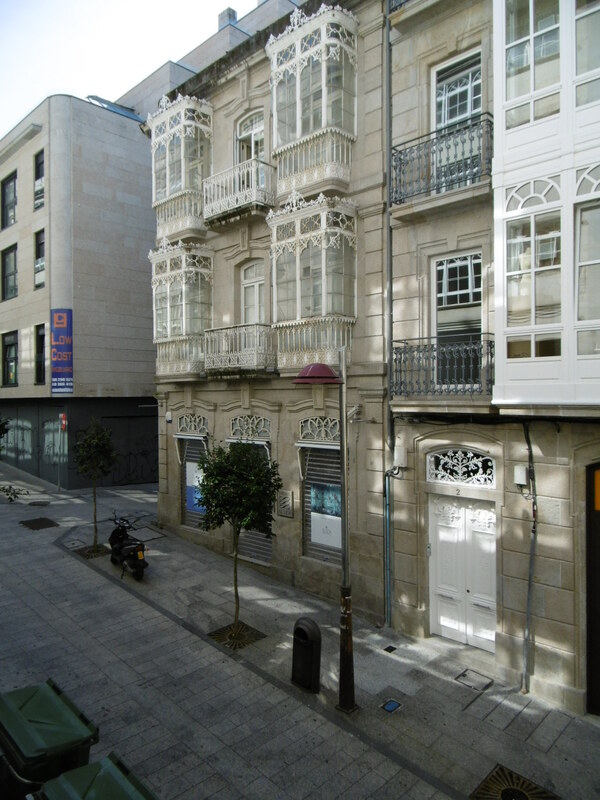 I’m hoping that Vigo remains ‘undiscovered’ – I loved it. Such style! And such food. 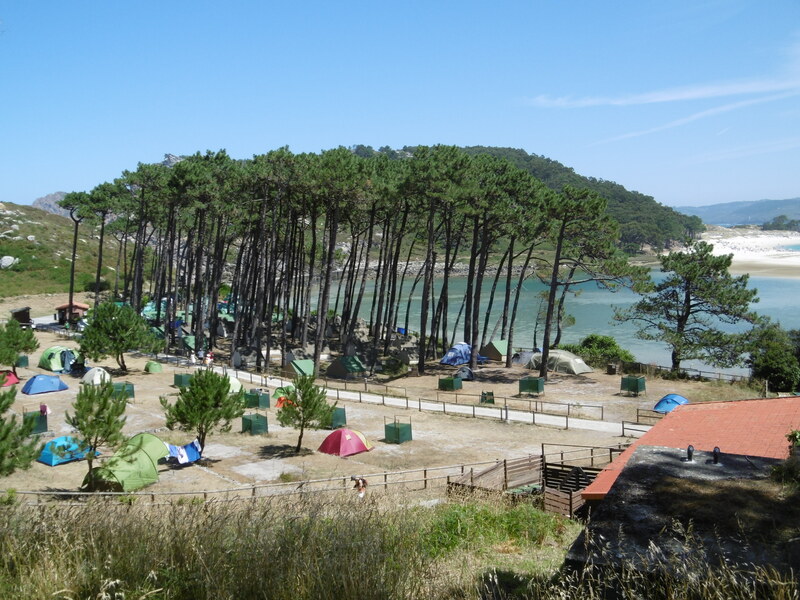 And that islan6.dn – a camping trip in the offing I think next time. 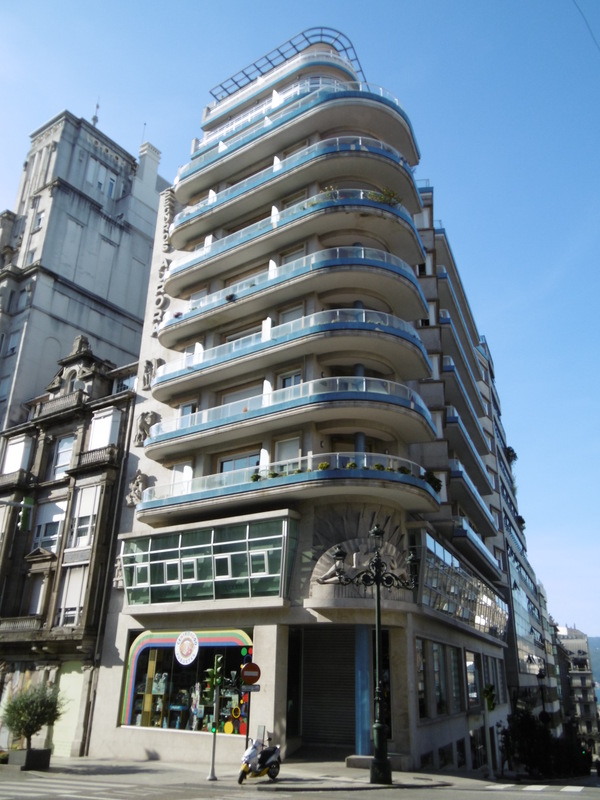 There were plenty of stylish, eccentric and just plain old hotels around =- we’ll maybe book our own if/when we go again. Just to add to the experience. The other thing I didn’t mention is that there were so many bookshops – and a book fair on when we were there. Bucking the global trend. My gosh. 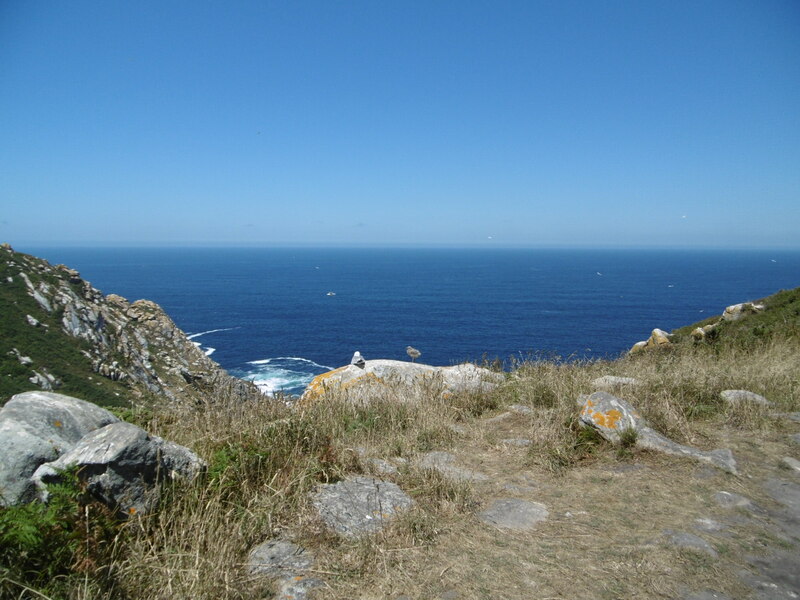 I pity your legs all the climbing, but … those views! 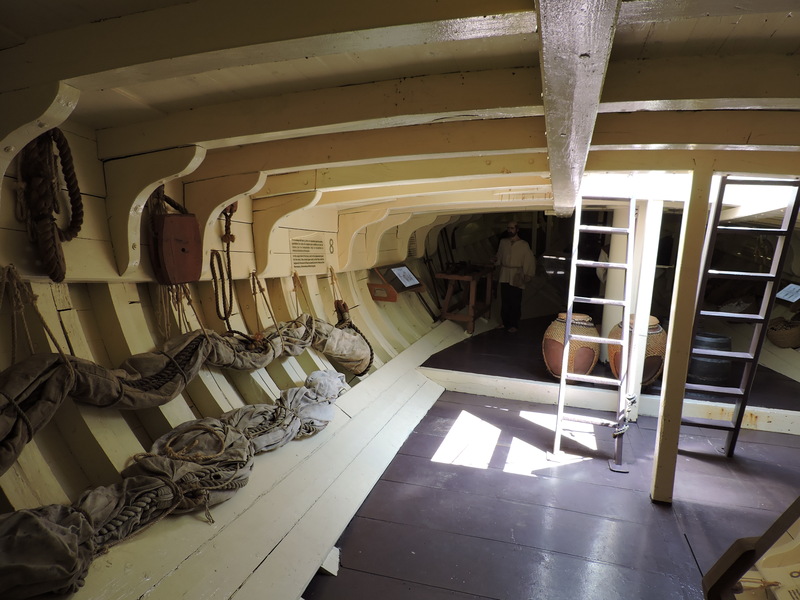 Although I love a good panorama, I think my favorite part of this post was seeing the inside of the Pinta. Can you imagine crossing the ocean — twice — inside that thing? Historical consequences aside, I have a whole new level of respect for Columbus and his crew.